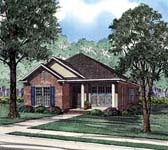 Family gatherings are a must in this home plan. A quaint foyer leads to a large breakfast room with bay window and view of the great room fireplace. Just off the great room is a bedroom with optional French doors that can easily be used as a den or study. 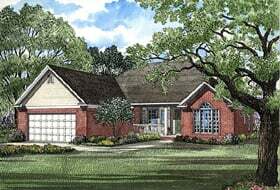 This split bedroom plan allows the master suite great privacy to enjoy the spacious bedroom with boxed ceiling, private bath including a corner whirlpool tub, separate shower and enormous walk-in-closet. The laundry room has extra storage and is conveniently located between the garage entry and Kitchen. The rear grilling porch is a wonderful accent to the back yard and perfect for entertaining friends.